We have known since the release of Halloween II that Rob Zombie would not return and that TWC and Dimension intended to continue making Halloween films without the musician/director. Since then a few names have floated around the 3-D project, but Patrick Lussier felt the most qualified. Lussier did a bang up job on My Bloody Valentine 3-D and should no doubt bring the Halloween series back from the depths Rob Zombie had previously sunk it. Knowing that Lussier will in fact direct the third film in the rebooted series could mean that Todd Farmer will hammer out the screenplay from now until November. Todd Farmer has penned screenplays including; Jason X, The Messengers, My Bloody Valentine 3-D and recently finished "Drive Angry" which Lussier will direct immediately following production on "Halloween 3-D" with Nicolas Cage in the lead. If Farmer does in fact write the screenplay for "Halloween 3-D" that would make 3 films in a row he and Lussier will have done together in the span of two years. 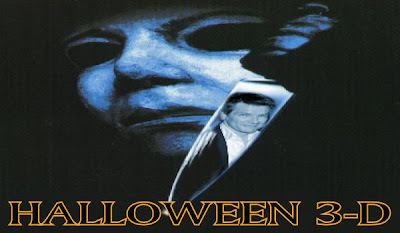 Simply, my money is on Farmer to come up with a solid take on the franchise, one that will get Myers fans happy again.